If you’re like me, your dog is not just an animal, but a member of your family. Why does everybody get a gift on their birthday or Christmas while your dog gets left out? Well, no more! Check out this review of the most amazing pet toys and the best gadgets you can buy online. Walking your dog in the dark can be dangerous. This illuminated and reflective harness can help you make things more secure. It uses multicolored LED fiber optics so you can choose between 8 different bright colors (Red, Yellow, Magenta, Blue, Purple, Pink, Green, and Cyan.) But not only that, you can make the colors flash in different modes, like a rainbow, disco dog, or cool comet. It is lightweight, all season and rainproof, machine washable, and uses a rechargeable battery that will last for 12 hours. This dog toy is an automatic dog ball launcher that will keep your pet entertained until he is exhausted. It’s designed for small dogs and includes 3 mini tennis balls. The balls are launched at a distance of 10, 20, or 30 feet depending on your selection, so you can use it indoors or outside. Can be used with the power cord plugged into a wall outlet or with 6 C-cell batteries, which makes it super portable. All it takes is 3 simple steps: train your dog to drop the ball into the iFetch, encourage him to fetch it when it flies out the iFetch, and let him bring it back for more fetching fun. It’s always best to have a constant supply of fresh and clean drinking water for your dog. 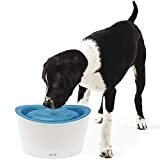 Leaving it sitting in a bowl will only let it get full of dust and dirt, and that’s why you need this dog water fountain. The large surface area adds oxygen to the water, making it fresher, while the multi-stage filtration system absorbs any impurities. Having lots of fresh water available will help your dog to ensure proper kidney function, and this dog water dispenser has an elevated design to provide a much better drinking position. 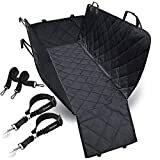 Your dog will not have to stretch his neck to reach the water anymore, and if he is suffering from arthritis, joint problems or is just a big, large dog, he will love this. 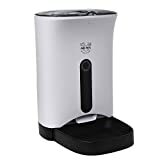 The Dogit automatic dog waterer can hold up to 200 fluid ounces of water, more than enough to last for several days, and it will not become stale or stagnant. It operates with an ultra-quiet motor that is virtually silent when running but will alert you with a gurgling sound when it needs more water. Oh, and it is perfect for cats too so it makes a great pet fountain for everyone! Dogs can’t jump in the shower and clean themselves, so you have to help them out with this dog grooming task. Why pay for having your dog bathed? The aquapaw lets you have a do-it-yourself dog wash right at home. The aqua paw bathing tool is sort of a bathing glove that fits on your hand and is perfect for bathing your pet. It is a sprayer and a scrubber in one easy to use tool, and you can use it outdoors with a normal garden hose. Some people use it for bathing their horse! The ergonomic, unisex design fits all and straps securely to your hand, be it the left or the right one. Having a sprayer in the palm of your hand really helps when you are giving a shower to a dog with dense fur, and as you rub your pet he gets a soothing massage that reduces stress. To use it you just press a button in the center of the tool, which you can easily do with two fingers. 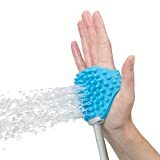 This leaves your other hand free to control and keep bathing your dog. If you’d rather bathe your pet inside you can use the included adapters that let you connect the aquapaw to the shower. There are lots of ball throwing machines for dog to play fetch, but the hurricane 9 dog toy uses discs or rings instead, which go flying in the air when you shoot them. When you use the hurrik9 it launches the rings for more than 100 feet thanks to the special slingshot mechanism. Depending on how much you pull back the ring will travel a shorter or longer distance, so you can control how much do you want your dog to run. The rings are super durable and made especially for those hard, pointy dog teeth. They use only non-toxic materials and float in water so you can use them in the pool. They are much easier to use than those slobbery tennis balls that always seem to get dirty. If you are a Shark Tank fan you might recall seeing the K9 being pitched to Kevin, one of the original sharks, who said that this dog toy would do very well because it was a lot of fun! Ok, we already showed you an item to take care of your dog’s water, so now it’s time to talk about one of the best automatic dog feeders. It includes a dishwasher-safe removable bowl, and you can use the auto feeder by plugging it to the wall or with 3 “D” batteries. Once you turn it on you program the digital clock and timer to schedule the feeding times, and you can schedule up to four meals per day. But the thing we love is that you can record a message and have it play every time the food is available. Your dogs will love to hear you saying “feeding time” and will come running to have their meal. The feeding system accepts most dry foods for dogs and cats, and the magnetic closing lid will keep your pets from reaching into the dispenser. Meal portions are completely adjustable to fit your pets needs no matter what size it is, and the pet feeder uses a removable food storage bin that can be easily removed for quick cleanup. The Whistle 3 dot tracker is a smart dog collar GPS gadget that works as a high-tech pet tracking device. But not only that; it is also a dog activity tracker so you can keep an eye on how much exercise is Fido getting. 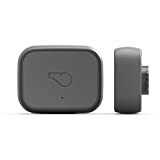 To get started you place the Whistle 3 on its charging dock and download the tracker app to your Android or iPhone cell phone. 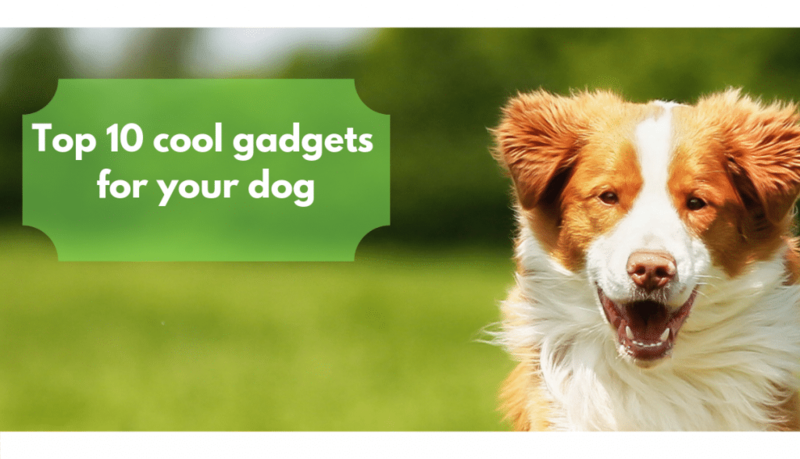 You then attach the device to the pet’s collar and get peace of mind. With the tracking app you can set custom safe places and get alerts when your pet is out of bounds, and you can track them anywhere, 27/7, as well as check out the trips it’s made over the last 24 hours. The GPS tracking app can pinpoint your pet’s location anywhere in the US, and the GPS dog collar device can attach to any collar or harness up to 1″ wide. Does your pet like to go out for a swim? No problem! The whistle 3 tracker is durable and waterproof. It is, however, recommended for pets 8 lbs and above. There is no dog in the world that doesn’t enjoy a car trip, but getting your back-seat full of paw prints and dog hair can be frustrating. With this back seat dog cover, your problems are solved. It is a versatile item that is not only a car seat cover but also a car dog bed and a hammock. Made with four layers of durable materials, the side flaps will keep the seats from any dirt, fur or scratches. It is available in a variety of sizes and can fit in most cars, trucks, and SUVs, so it’s not only good for small and medium dogs, but also for big, large breeds. Installing it is a breeze thanks to the quick, release clips. You simply snap the buckle strap around the headrest and tuck in the seat anchor. The slip-proof bottom is made of PVC to keep the cover in place, and velcro openings let the seat belt thread through. The back seat pet cover can be hand-washed or tossed in the washing machine in gentle cycle. Ever wondered how to keep your dog from barking? You’ve probably thought about getting him one of those aanti-barkingdevices that deliver a shock. PLEASE don’t! Could you imagine getting shocked every time you yelled? Then why do it to your pet? Dog shock collars are a thing of the past, and today we use more humane and harmless gadgets to keep the barking under control. Oh, and those collars that pump out citronella? Nah, don’t bother, they don’t work with most dogs. 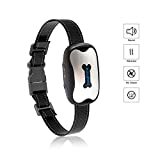 The best anti bark collar we can recommend is the Pop View, which uses painless sound and vibration stimuli to deter annoying barking. It detects the movement of your pet’s vocal chords and makes an audible sound to tell the dog to stop. If it doesn’t, the device will start to vibrate. Your dog will soon understand this and start to change his behavior. You can adjust the sensitivity for better results on your pet, and its universal size is adjustable for any dog’s neck, suitable for all breeds and sizes. It is weatherproof and can be worn outside, and is powered by one 6V battery, which is included. The edge is made of stainless steel and reaches through the dog’s topcoat to safely remove the loose hair and undercoat. Pressing a button on the head of the brush releases the removed hair. It is recommended to deshed your pet after washing and drying for best results, but you can use the Furminator every day to make sure those hairs don’t end up in your coffee or sofa. 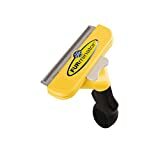 There are several Furminator brushes available to best suit your dog, from extra small to giant breeds, and short or long hair can be treated, so choose the best grooming brush for your dog and enjoy not having piles of loose hair blowing across your floor anymore.